Each of the 121 symbols painted on a tail fin associated with Major Heinz Schnaufer's Messerschmitt BF 110 on the Australian War Memorial's World War 2 section represents a 'kill' by the pilot of an enemy aircraft, predominately Lancaster, Halifax and Wellington bombers. Of the 125,000 men of all nationalities serving with Royal Air Force Bomber Command during WW2, 55,550 were killed, 9,838 became prisoners of war, 8,500 were wounded, 1,500 managed to evade capture and 100 escaped from POW camps. Apart from anti-aircraft fire, weather, collisions, human error and accidents, the major contributor to Bomber losses were the German Luftwaffe Nachtjagd [night fighters]. The principal aircraft used for night interception was the twin engine Messerschmitt BF110 armed with two 20mm cannon and four machine guns in the nose and one rear machine gun operated by the second crew member. The most successful method of attack was to approach the enemy bomber from below and behind using the darker land mass as cover and the lighter night sky to silhouette the intended victim. Once in position, the pilot would pull up and fire in an attempt to hit the fuel tanks located between the fuselage and the inboard motor so as to cause maximum damage. As the tanks were not self-sealing, a few well-placed shots usually caused the aircraft to catch fire or explode. 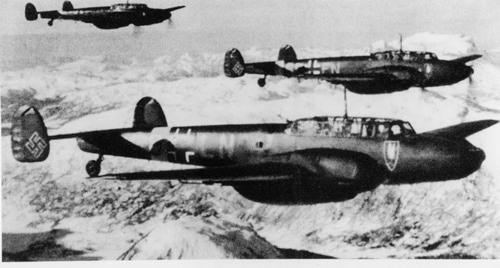 In late 1943, a vertically firing cannon code-named ‘Schrage Musik’ or ‘Jazz’ was installed in the BF 110 which gave the pilots a choice of using the standard method of attack or position their fighter some distance below, climb gradually to the bombers blind spot underneath where there were no defensive machine guns and use the vertical cannon on an angle of 70 degrees from a distance of about 100-200 metres. Schnaufer wrote that he generally aimed at the right hand wing because he sat in the left hand side of his cockpit and the sights were mounted above him in the cockpit roof. In addition to this, the wing made a large target and with it’s two motors and the fuel tanks between them made it the bombers most fatal point. Among the German pilots, many caused enormous losses to Bomber Command. Oberleutnant Helmet Woltersdorf with 24 ‘kills’, Major Heinz Schnaufer  Hauptmann Ludwig Becker  Major Heinrich Prinz zu Sayn-Wittgenstein  and Oberst Helmet Lent  to name a few. Major Schnaufer was definitely the most successful night fighter of WW2 although the others had potential to exceed his tally but were killed before the war ended. The British author and Nachtjagd expert, Peter Hinchliffe, estimated Schnaufer and his crew destroyed the equivalent of five complete squadrons, putting out of action approximately 850 British, and Allied aircrews with the possibility of those shot down, 700 being killed, 125 becoming POW, s and 25 evading capture and returning to England. Of the 4050 Australians killed with RAF Bomber Command, 38 are believed to have been shot down by Schnaufer. On the night of the 21/22 of February, 1945, the crew of Lancaster Bomber NG329-JO-Z with Number 463 Australian Squadron were returning from a raid on the Mittelland Canal with a ‘hung up’ 1,000 pound bomb. The canal was one of the vital waterways supplying material to the Ruhr industrial area, an important part of the German war effort. Under normal circumstances, the crew had flown in Lancaster B1 LM 130 with the gaudy ‘’ Nick the Nazi Neutraliser’’ motif emblazoned on her nose but this particular night, Nick was in the hanger for a major inspection and service after completing 86 operational sorties. This was a fairly rare luxury even at this late stage of the war. While they were still over enemy territory, the ‘skipper’ Flying Officer Graham Farrow from South Australia, put the aircraft on a level flight and opened the bomb bay doors for the bomb-aimer, another Australian, Russell Bermingham, to try and free the bomb. Shortly after the bomb was finally jettisoned, the Lancaster was hit from stem to stern, cannon shells damaging the starboard engine and shattering the navigator’s table, the electrical panel and starboard wing flaps. The Flight Engineer, Stan Bridgman was wounded in the legs by shrapnel. Although none of the crew could positively identify the source of the attack, the mid upper gunner Frank Bone, thought he saw an aircraft pass from port to starboard moments before the attack. Fire started to spread quickly over the starboard wing. Flying Officer Farrow decided the situation was rapidly getting out of control and ordered the crew to put on their parachutes and bail out as it was obvious the aircraft was doomed. Holding the plane steady while his six crew exited was a manoeuvre that was extremely dangerous leaving him little time to exit the burning aircraft himself. With his men gone, the ‘skipper’ was able to jump out the front hatch with the bomber almost upside down. Lancaster JO-Z crashed in the Dutch forest of Ysselsten, the eighth victim that night of the Ace night fighter, Schnaufer. The odds against surviving a crippled bomber in its death throes during WW2 were extremely slim, [one in four] therefore it’s possible the crew were spared a horrific death because the ‘Schrage Musik’ cannons on Schnaufer’s fighter jammed at a critical moment causing the German to break off the attack. In a letter to Mr Bridgman after the war, Schnaufer’s radar/radio operator Fritz Rumpelhardt, confirmed the attack on the Lancaster and the guns jamming. [They both eventually met in Gutersloh, Germany in 1987.] Fortunately for the crew, they managed to land in Allied held Dutch territory and were able to eventually make their way back to their base in Waddington, England. A Bomber Command investigator wrote in his report that Flight Lieutenant Farrow had exercised outstanding qualities of leadership and by his cool and calculated instructions in an emergency had enabled his whole crew to bail out safely. All the original crew [minus Bridgman] returned to duty completing eight more operations. Luck still held for Farrow. 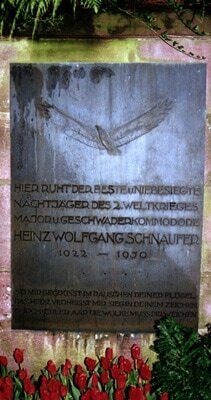 On the 14/15 March, his plane was badly damaged by flak and only just managed to limp back to base. When the war in Europe ended in 1945, both Farrow and Schnaufer were only aged 23. With his country defeated, Major Heinz Wolfgang Schnaufer, Holder of the Diamonds to the Oak Leaves with Swords to the Knight’s Cross of the Iron Cross and Commander of Nachtjagd 4, had the unpleasant task of making a final speech to the remaining men of his squadron. The Squadron that had shot down approximately 579 bombers during the course of the war. In part of the speech, he referred to the loss of four hundred officers, non commissioned officers and men including fifty officers and men who died in ground combat or defending the base against air attacks. 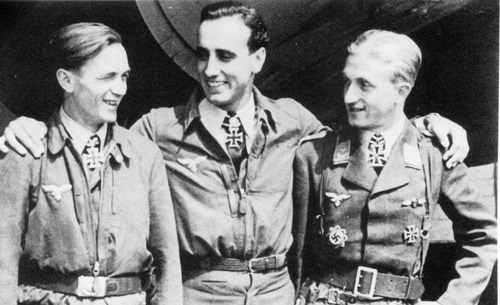 Schnaufer and his crew members, Rumpelhardt and Gansler was the only complete crew to be awarded the Knight’s Cross in the entire Luftwaffe. In April 1945, the crew of JO-5 were officially welcomed into the most exclusive aviation club in the world. A letter was sent to Flying Officer Farrow and his crew. ‘I have much pleasure in welcoming you all as members of the Caterpillar Club, and in sending you your membership cards and Caterpillar Pins herewith, with our compliments and hope the pins will bring you good luck. Wishing the seven of you the very best of luck. It was signed by the founder of the club, Leslie L Irvin. Schnaufer was taken prisoner by the British in May 1945 at Eggebeck in Schleswig-Holstein but released later that year and returned to his home town in Calw and took over the running of the family wine business. In an ironic twist of fate, the man who survived the war unscathed was killed in a car accident in France in 1950 by a speeding French truck driver. Rumours began to spread that he was assassinated by members of the former French Resistance but were disproved when the Schnaufer family’s independent autopsy agreed with the French authority’s autopsy that the accident was the cause of death. Gansler worked in the Schnaufer family wine trade, Rumplehardt became an Administration Officer in an Agriculture College in West Germany. Farrow, Bermingham and Wiltshire returned to Australia while Harris, Bone, Clay and Bridgman went back to England. The remains of JO-Z were still visable in the woods at Ysselsteyn up until 1980. Rows of tucker rivets on a portion of the fuselage still looking as though they had only just left the factory. A testimony to the quality of the Lancaster. 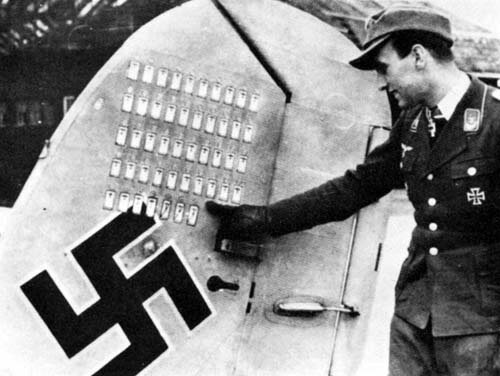 Major Schnaufer pointing to the small symbols on the tail fin of his aircraft which represented "a kill". The right hand fin that is on display in the Australian War Memorial was sent to Australia as part of a group of items collected by Royal Australian Airforce /Australian War Memorial historical representatives in England immediately after the war. The left hand fin also captioned as being associated with Schnaufer’s aircraft is in the Imperial War Museum in London. They are stark reminders of the terrible waste of life on both sides during WW2. Photographs. Kind Permission by Peter Hinchliffe. OBE. Schnaufer-Ace of Diamonds. Peter Hinchliffe. Tempus Publications, 1999. Chased by the Sun. Hank Nelson. ABC Books 2002. National Archives of Australia. Canberra.ACT. Australian War Memorial. Canberra. ACT. Personal material by kind permission Mrs R Farrow. RAAF Historical Section, Department of Defence. Canberra. ACT. Major and Geschwaderkommodore Heinz Wolfgang Schaufer 1922-1950. Onward proud eagle, to thee the cloud must yield.